In her two major releases of the past year, Julianne Moore has played someone who experiences, in one way or another, incontinence (and yes, we refer to THAT kind). In Maps to the Stars, it’s clearly played for darkly humorous effect; but in Still Alice, her moment of embarrassment is something much more discomforting and heart-breaking – and that’s more than we can say about wetting one’s pants. It is one of the many signs that Dr. Alice Howland – Moore’s character in the film, who is diagnosed with early onset Alzheimer’s – is starting to fade away due to her rare disease, something signposted when she starts forgetting words like “lexicon” in a lecture, and greeting her son’s girlfriend moments after she did so already. Unfortunately, there’s nowhere for her to go from there onwards but down, as it takes away more and more of her everyday capabilities from memory to, eventually, coherent speech. It’s as every bit as daunting as you can imagine; and yet, it is also morbidly watchable. Much of that watch-ability is down to the film’s ultimate attraction, which we intend to discuss a little later on, but first let’s talk about all the other elements that have gone into making such a resounding film. 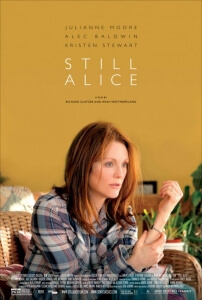 Director-writers Richard Glatzer and Wash Westmoreland have for the most part managed to avoid falling into generic traps when it comes to portraying real-life illness – the closest it truly gets to familiar territory is an inspiring speech given by Alice to an Alzheimer’s conference, where she must use a highlighter to underline parts she has already covered. Everything else is surprisingly straight-forward when depicting the disease and its effects on this character, with every development coming naturally and not all at once. They recognise that this is no “movie illness”; this is something much more harmful and true, and it can take a hold of anyone either via natural or genetic causes (Alice’s eldest daughter Anna, played by Kate Bosworth, also tests positive for the disease). In a mixture of understanding both the scientific and emotional aspects of this particular disease, and a possible influence from their own experiences with neurological disorder – Glatzer lives with ALS, or motor neurone disease – they have delivered a film that is as well-made and crafted as it is performed. Speaking of performances, you’re probably dying to read our take on Moore’s Oscar-winning portrayal – and you will, but first let us give kudos to supporting players Alec Baldwin and Kristen Stewart, both of whom deliver astoundingly grounded performances as Alice’s husband and youngest daughter respectively. Baldwin, despite it being difficult to not picture his 30 Rock persona Jack Donaghy in every scene (that’s what binge-watching does to you, kids…), nonetheless carries a good amount of the film’s heart, struggling to accept his wife’s deteriorating condition while also facing copious demands from his job that prevent him from being around more to care for her. Stewart, who with every film she’s been in since her association with Stephanie Meyer gracefully came to a close seems to be improving more and more, reaches new heights here as an actress living in LA pursuing what turns out to be a flight of fancy. Her conversations with her fading mother, culminating in her reading a passage from the play Angels in America, highlight Stewart at her peak, as someone not comfortable facing either reality, both professional and personal. But wait; there’s Moore – and now having seen her in action here, we can confirm she deserved everything coming her way this past awards season. The word simply does not exist to describe her performance here, and we feel that just typing about it on a website does not do it justice. It is something that needs to be seen to be believed. Now, there have been many actresses before her and many actresses after that have portrayed and will portray Alzheimer’s in a shockingly realistic light, but with Moore you can tell in every inch of her body the exact moment where she is in her rapid decline, never going over-the-top but staying amazingly subtle all throughout. The most shocking parallel is a scene between Alice and her past self; in a video made early into the process, you can spot just how different she looks in comparison to how she really is then. Any good actor can alter their physicality and appearance to such an astonishing effect, and Julianne Moore is no exception. If there’s any reason you should go and see Still Alice, it’s for her. She, and the rest of the movie, is (apologies in advance) unforgettable.